Welcome to River Romp! 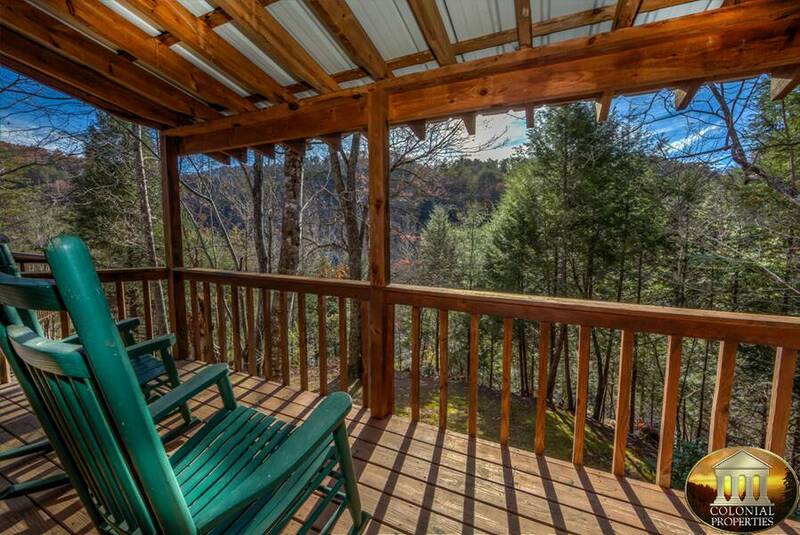 This beautiful 1 bedroom, 2 bath cabin getaway sits above the Little Pigeon River, providing it's guests with relaxing sounds of the rushing water below and wonderful amenities that you're sure to love. 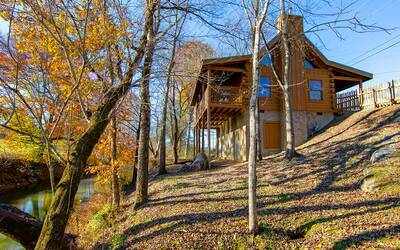 River Romp is a two level vacation cabin featuring a cozy living room with a wood burning fireplace, fully equipped kitchen, and a stunning bedroom with adjoining bath on the main level. Upstairs is the perfect place to kick back, relax, take a nap or read a book. You'll love laying in the large, indoor knitted hammock, as it wraps you up in total comfort! 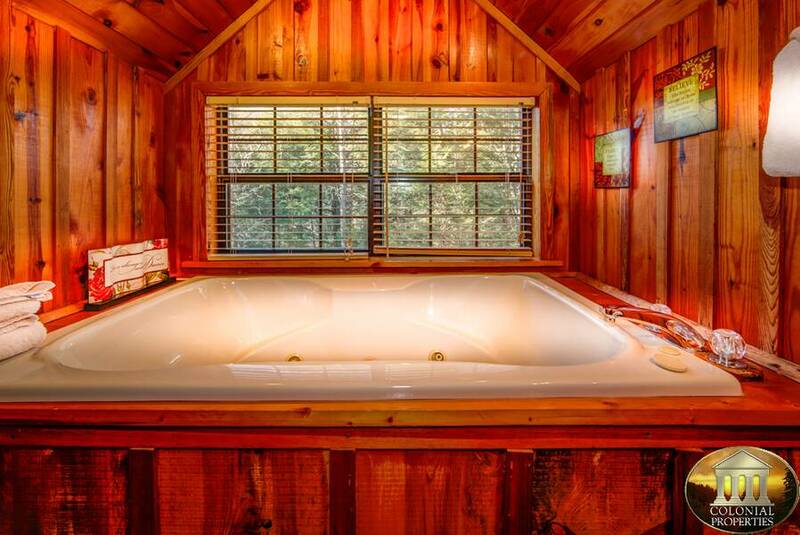 When you want to truly relax, jump into the 2 person jetted tub! It's a great place to destress and regroup! 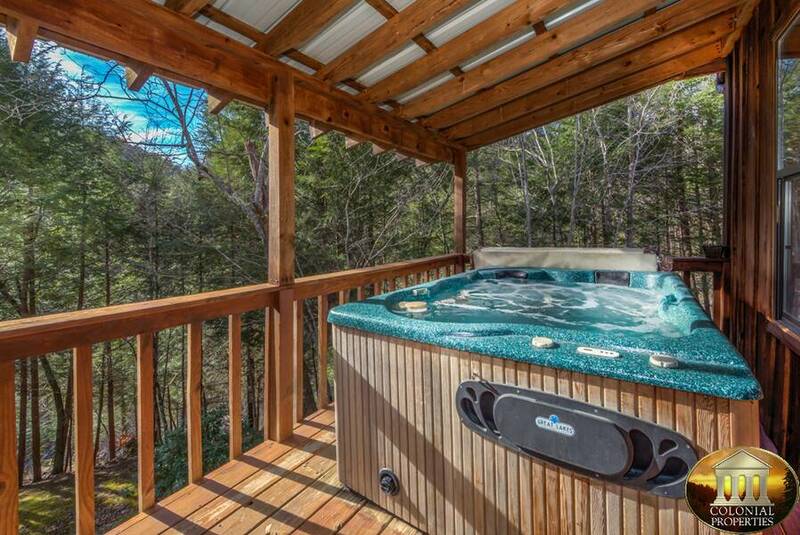 Step outside and sit a spell on the covered porch in one of the rocking chairs or throw on a bathing suit and jump into the steamy outdoor hot tub! With all of these great amenities awaiting you and your special guest, you're sure to enjoy your time at River Romp! A: At this time it is not available. A: Hi Nerissa! This is not a pet friendly property. We do have properties on the program that are pet friendly. A: Hi Savannah! Yes it has a charcoal grill. 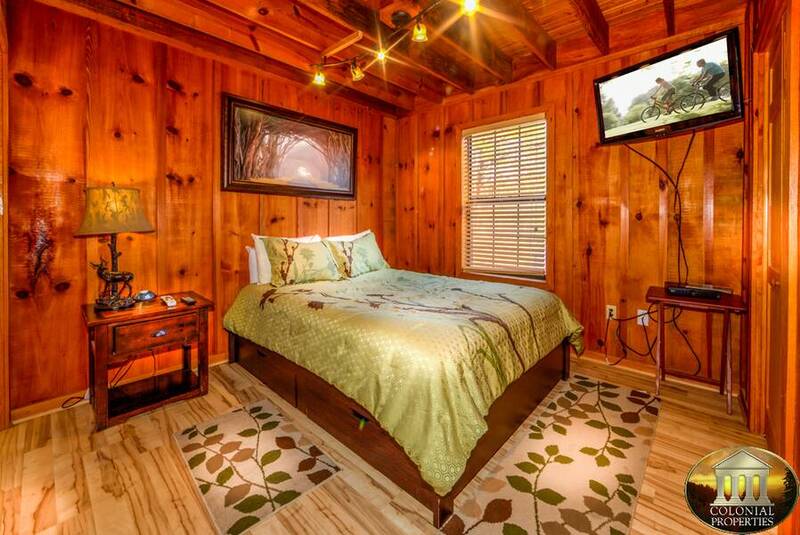 “ My boyfriend and I really enjoyed staying at river romp. He has never been to tennessee and I have lived there for over 15 years. 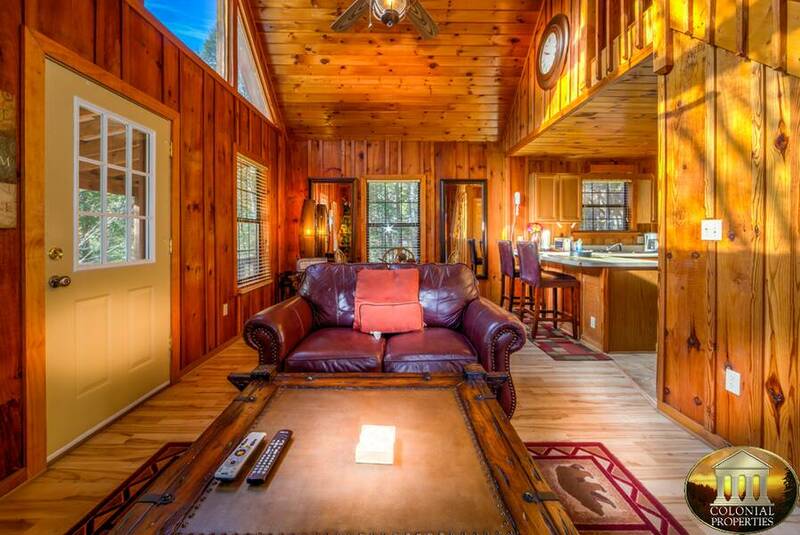 I have stayed in other cabins with my family but staying at this cabin was unbelievable. It was perfect for him and I. 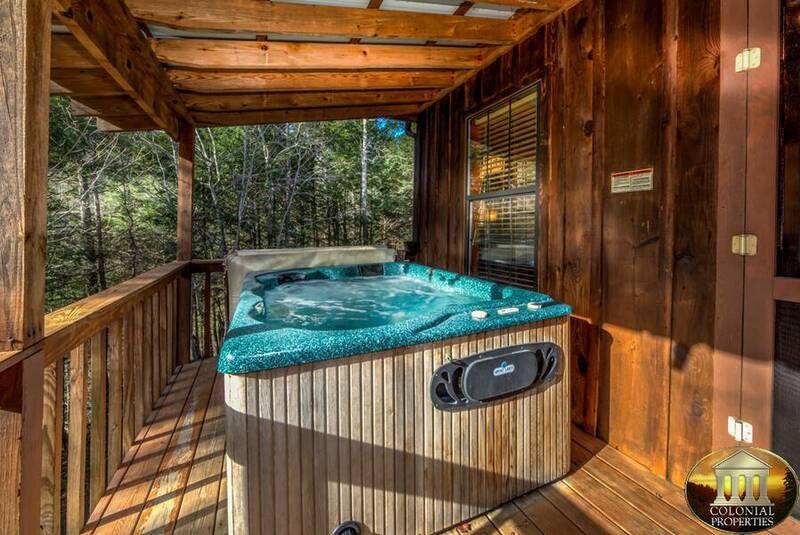 It has the river running in front of the cabin so we would sit outside and enjoy the rockers or the hot tub with the sound of the water. It was peaceful and we can't wait to come and stay in another of the cabins you have to offer. This was such a great get away and was right away from everything but still close if we wanted to get out and see the city. Thank you for allowing us to stay and enjoying river romp we both loved it. “ Great place! Loved the view, loved the location! Will be visiting again in the future!! 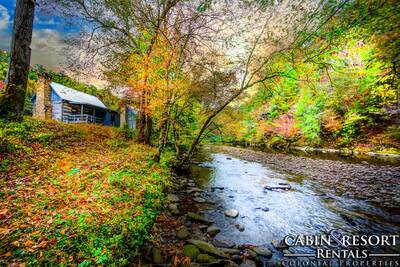 “ Loved the sound of the water flowing below our cabin day and night. 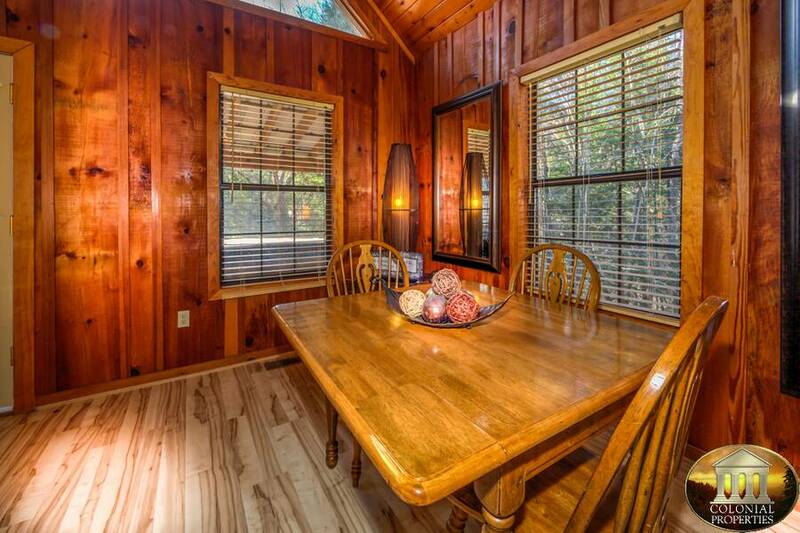 “ Very nice cabin we enjoyed very much, especially listening to the nearby stream at night. We had a very relaxing & enjoyable weekend and look forward to coming back in the future. 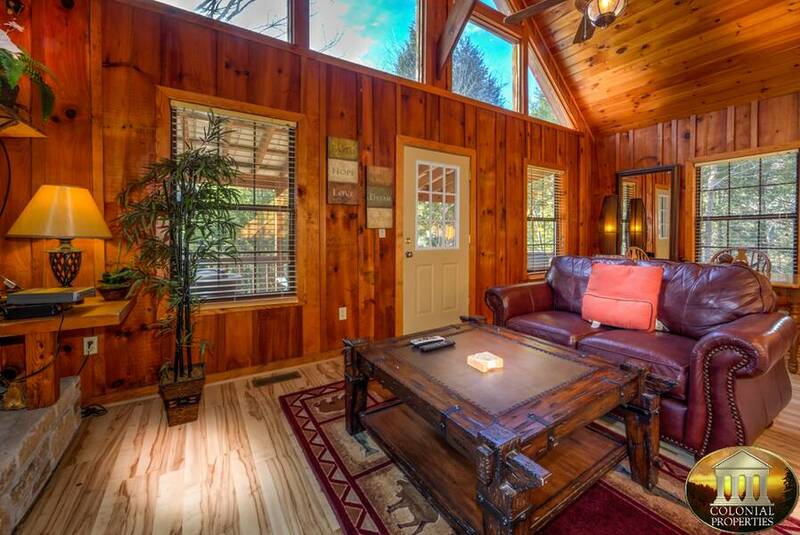 “ We very much enjoyed our stay at the River Romp Cabin through Colonial Properties. 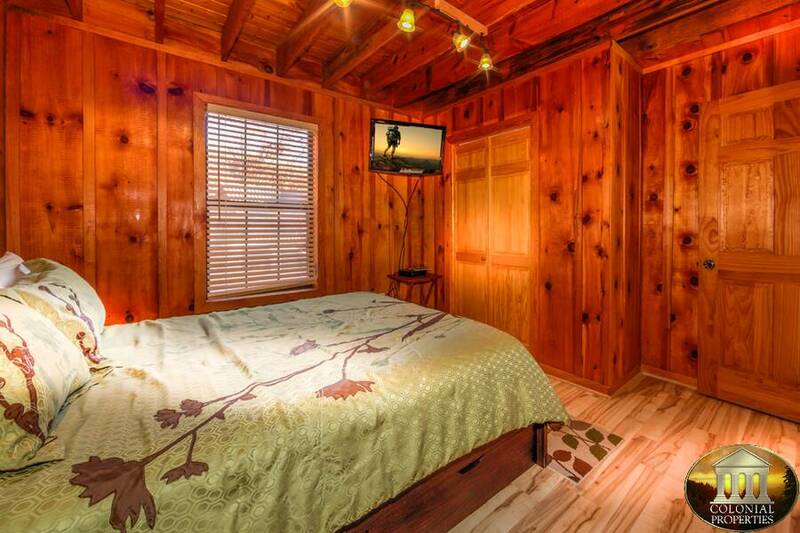 It was such a cute little cabin and was perfect for the 2 of us on our honeymoon. It was very clean and the hot tub was nice and hot when we arrived. We did a Sunday check in, and it was so easy and hassle free. 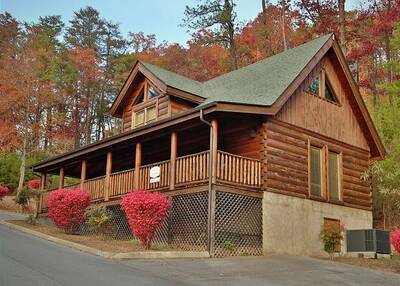 We plan on vacationing in the Gatlinburg/Pigeon Forge area next year and will definately be using Colonial Properties again. “ River Romp cabin was very nice and relaxing,it had everything you would need in a full functioning cabin but with just the right amount of cuteness. The stream at night was extremely relaxing to listen to and we will definitely be back in the near future. “ Loved our stay at this romantic little cabin. Listening to the river was especially peaceful. 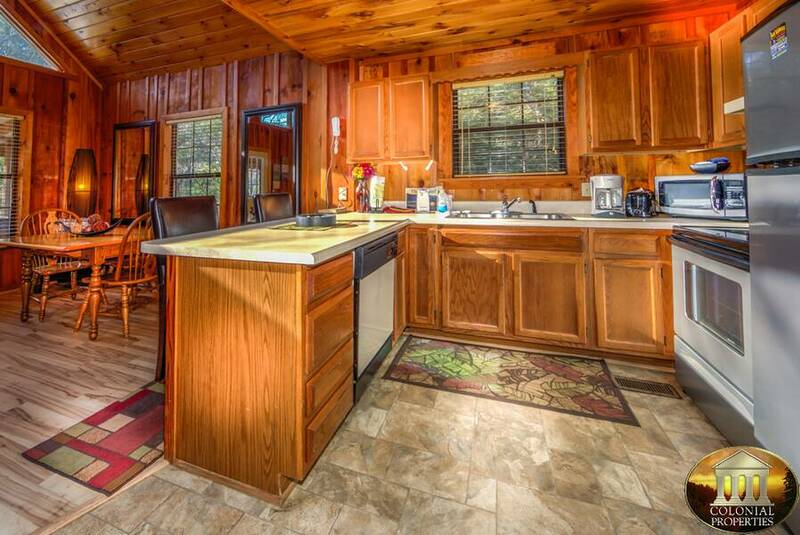 “ We loved the River Romp cabin. The cabin was very clean and cozy. We plan to use and refer Colonial Properties in the future. 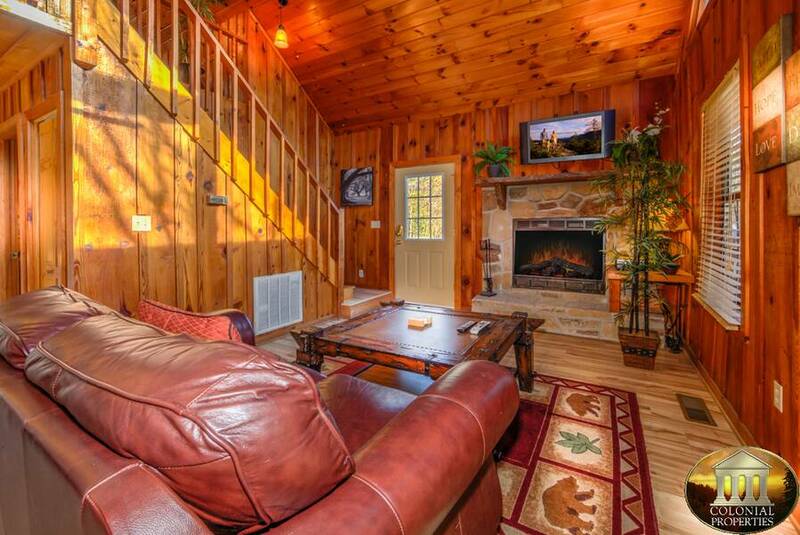 “ We stayed at the River Romp and it was really nice. When we walked in we were amazed how nice everything was. It was decorated soooo cute. Up to date appliances. The loft was spectacular. Overall we really enjoyed our stay and hope to return. Our visit was for our 12th anniversary. Thank again for everything. “ This is our third stay with Colonial Properties and we have enjoyed each stay! Thank You! 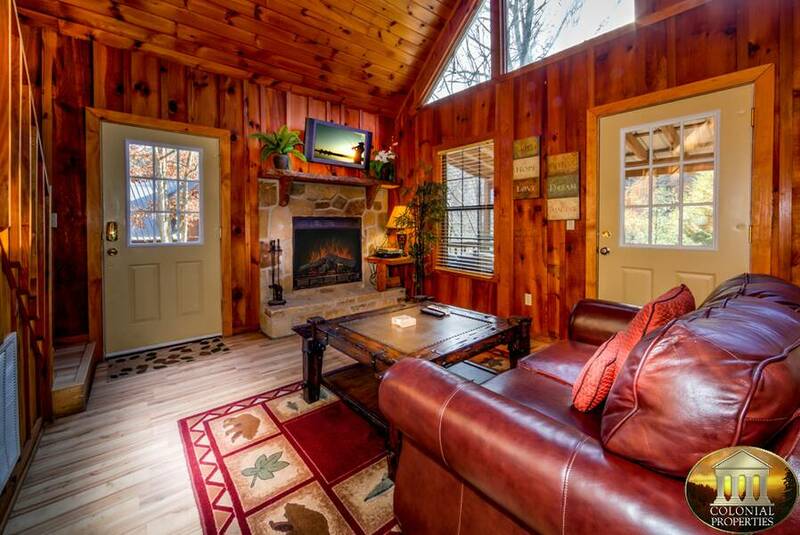 “ Loved the cozy cabin. “ Place was beautiful and cozy. Comfy bed too. Very peaceful and I would definitely go back! “ We loved our stay at River Romp. It was a wonderful honeymoon retreat and hope to revisit often. 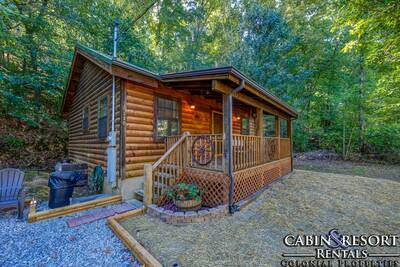 “ The cabin was well equipped, nice, and comfortable The cabin made our stay peaceful, quiet, and very relaxing. We look forward to coming back again! 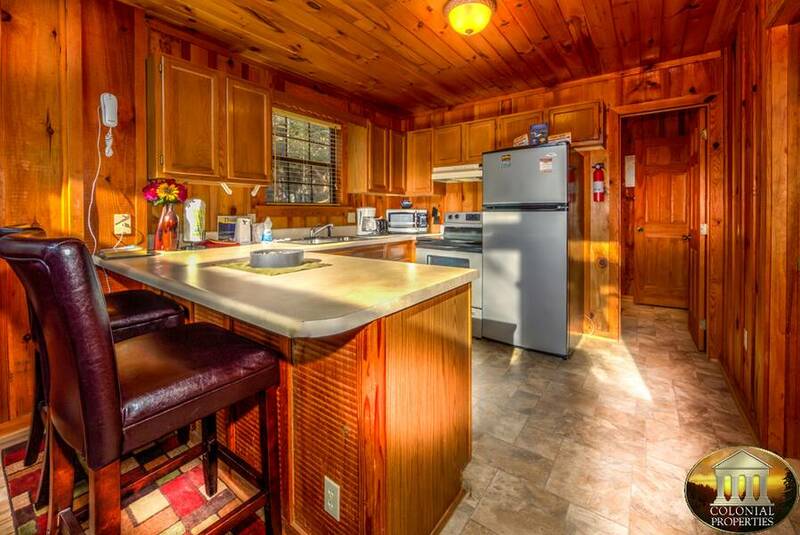 “ The River Romp cabin was very fun. It had a beautiful view of the river that is constantly flowing behind it and is very easy to fall asleep to. It was located not very far from all the shopping and tourism events. I would recommend this cabin rental to anyone I know especially for a honeymoon. The privacy was great and I plan on staying in the future. Thanks for making my honeymoon one we will always cherish. 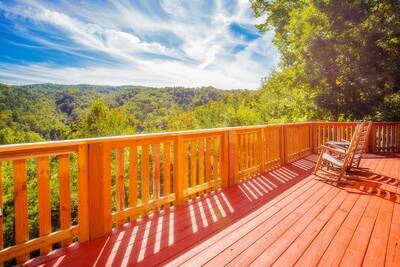 “ The cabin and location were absolutely beautiful!! 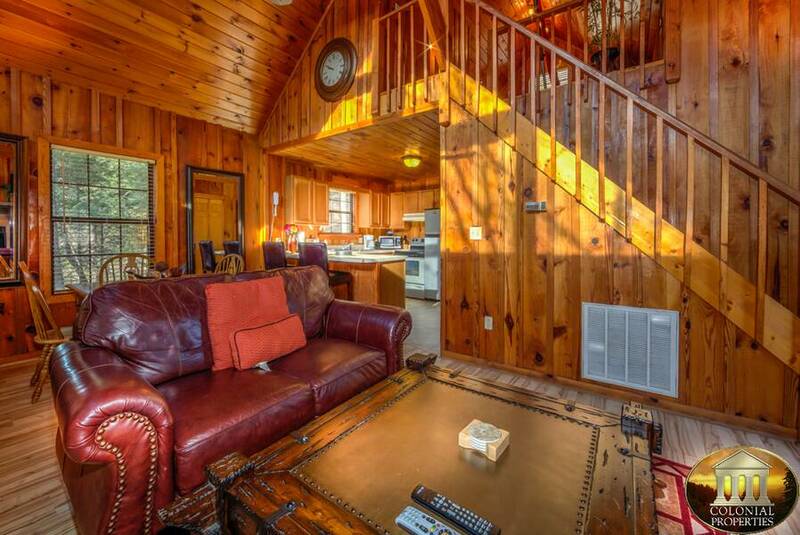 The cabin was very clean and beautifully located overlooking the flowing water. Nice touch with the artistry of the towel folding in the bathrooms and the bed. 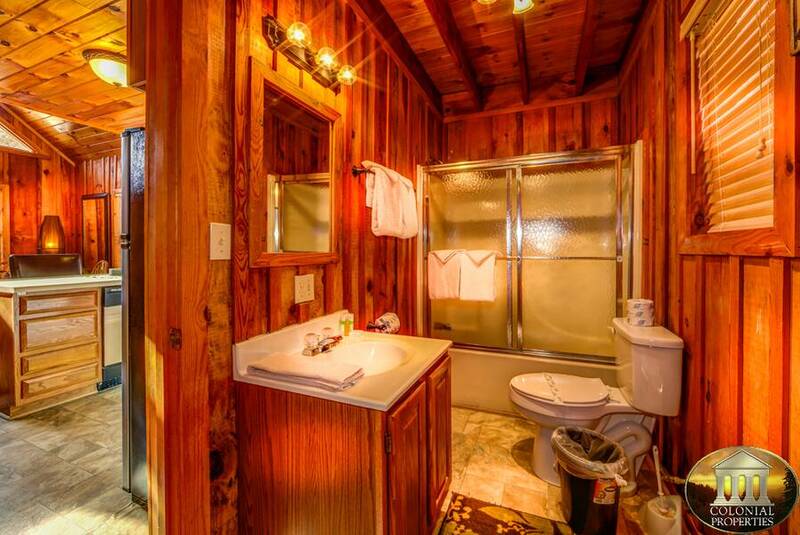 Two bathrooms were perfect for me and my fiancee...a his and hers. All appliances one could need were available and clean. No insects were inside the cabin except some friendly ladybugs upstairs. We found a pool table upstairs rather than the indoor hammock as shown on the advertisement which was a nice surprise. The indoor lighting was not overpowering anywhere except the mirror lights..perfect for the ladies putting on makeup. I fell in love with the upstairs jetted bathtub, very roomy and relaxing not to mention the view..same goes for the hot tub! I did not check and option for wifi availability on purpose and was delighted that there was no wifi and very limited signal...this gave me and my fiancee the much needed time away together with no way work could reach us so we could just enjoy and relax. It snowed our 1st night there, whuch made everything that much prettier over the mountains, down below on the water and all the little cabins near by. We did go visit Ripley's Aquarium and had a great time looking at all of the exhibits, it truely lives up to its reputation. However, we did not get the opportunity to take advantage of the cabin discount of the ticket price, as the information was was not in view and only found it looking for a earing back the fell on the floor...at this point, we had already went to the aquarium. No worries though, but I would suggest better placement. Only complaint is, we wished we had booked it for longer. We will definitely be back next year if not sooner! 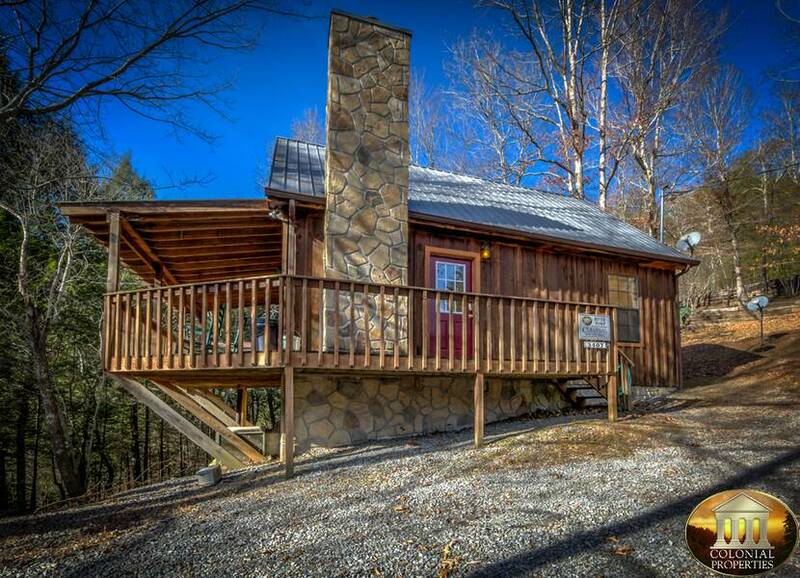 “ Great location off the road. Quiet and peaceful. Cabin was very nice and very clean. Easy drive to points of interest and any kind of shopping. Would come back again.